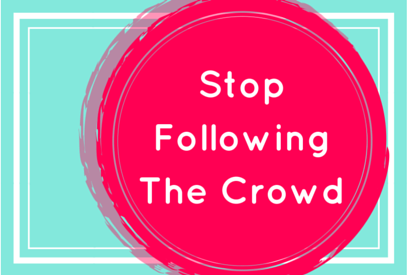 If you want to stand out from the the crowded marketplace, then Stop Following The Crowd! You want to be a leader and not a follower otherwise you’ll be known as a “Me Too” player in the market. Start thinking outside of the box and tuning into to the amazing possibilities of your business. 1. Look outside of the industry for your inspirations — Inspiration can come from many places, not just in your industry. If you look outside of your industry, you’ll find new ideas your can incorporate into your brand that hasn’t been seen before. You can be inspired by an era in time (the 50’s and 60’s), you can be inspired by a TV show (Project Runway was mine), you can be inspired by something else (nature, the beach). The point is look at other points of inspiration for your brand and you won’t look like everyone else. 2. Write down a list of things you like about various brands — Getting words down on paper is important. List out 5 brands you like and words that you associate with the brand. An example is Apple — clean, simple, minimal. Those are the top 3 words that come to mind. Once you list out all 5 brands, you’ll see which words come up the most often. Chances are those words match your aesthetic and you can use it to guide your brand look and feel. 3. Think about how you can do things better — If you want to be a leader in the industry, you need to start being better than others. You can do this whether you have a big following or not. Look at what everyone else is doing and ask yourself, “how can I do it better?”. This question will spark your curiosity and imagination. Which tip are you going to incorporate into your brand? Let me know by commenting below.